Heart attacks are as serious as it gets, and not something you would ever take chances with. Yet it’s really common to speak with someone after a coronary event and hear they felt like something was wrong for a while, but didn’t get checked out. The more signs and symptoms you have, the greater the likelihood you’re having a heart attack. We recently sat down with Dr. Paul Oh, who leads the Cardiovascular Prevention and Rehab Program at the Peter Munk Cardiac Centre and Toronto Rehab Institute. Dr. Oh and his team primarily help people who’ve had heart attacks and other coronary events get back on their feet. 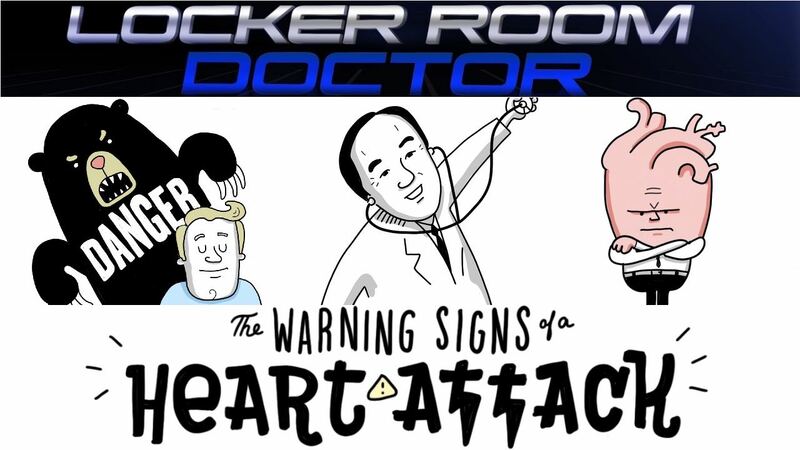 He shared with us the top three warning signs of a heart attack. A heart attack occurs when the flow of blood to the heart is blocked. And the red flagscan start hours, days or even weeks before you end up in the hospital. Sometimes they come and go, but just because the symptom goes away, it doesn’t mean you’re out of danger. The symptoms to watch for might not seem out of the ordinary, like feelings of indigestion, muscle strains or running out of breath when you’re active. That’s why it’s important to learn how to recognize when these feelings might actually be related to your heart. Chest pain is described in a lot of different ways, like pressure, squeezing, burning, or discomfort felt in the middle of the chest. The exact description of the pain isn’t too important here – because under normal circumstances, you shouldn’t be experiencing chest pain at all! If the pain goes away after resting for a couple of minutes, we would call that “angina”. Angina is caused by a temporary decrease in blood flow to the heart. However, if it lasts for several minutes and increases in intensity, we’d worry about this being a heart attack. We all get occasional aches and pains and these might occur in the chest area too. Dr. Oh’s “rule of thumb” is that if your chest hurts when you push on it, like with your thumb, then it’s likely a muscle or bone injury – not a heart problem. You might feel it in just one spot, or it may travel around. Again, how you would describe the pain is less important; because while one person may have a shooting pain, another would call it tingling or numbness. Watch for nausea, shortness of breath, sweating or feeling faint. These might not seem unusual if you’ve had a heavy meal or a tough workout, but if they are showing up for no reason, then it’s a serious concern. Now the big, bright, waving red flag is if you “feel a combination of these symptoms at the same time.” If this happens, you need get to an emergency department immediately. “I strongly recommend dialing 911, but some guys are even too stubborn for that. If nothing else, have a friend drive you to the hospital right away,” says Dr. Oh. Context is very important here as well. If you’re pushing yourself physically and something is wrong with your heart, you’re more likely to experience the warning signs. This is because you’re exceeding what we call, “your threshold, ”meaning your heart isn’t getting enough blood and oxygen. It can be scary to think there might be something wrong. A lot of guys would rather ignore the warning signs than get themselves checked out – but it’s far easier to address heart issues and maintain your health in advance than it is to recover from a heart attack. Pay attention to what your body is telling you and if those symptoms we discussed sound familiar, talk to your doctor as soon as possible.